Path of Exile (PoE) is an online free-to-play action role-playing game (ARPG) developed and published by Grinding Gear Games (GGG). The game was released for Microsoft Windows in 2013 and Xbox One in 2017. It was named 2013 PC Game of the Year by GameSpot and best PC role-playing game of 2013 by IGN. PoE took inspiration from the Diablo series but by all means, they are two completely different games. PoE is set in a dark fantasy world where the once mighty empire has crumbled and become a cursed land due to powerful beings fighting each other and trying to take control of the world. The land is now ruled by disorganized descendants of the empire and the wilderness is filled with hostile undead creatures, monsters and rouge exiles. At the start of the game, the player is exiled from the island of Oriath for some unmentioned reasons and shipwrecked on the coast of Wraeclast. The player must not only fight for his or her own survival in this chaotic world but also restore the order of the world by defeating the powerful beings. Similar to traditional RPG games, players slay monsters to gain experience points to level up so that they can use more powerful skills and equipment. 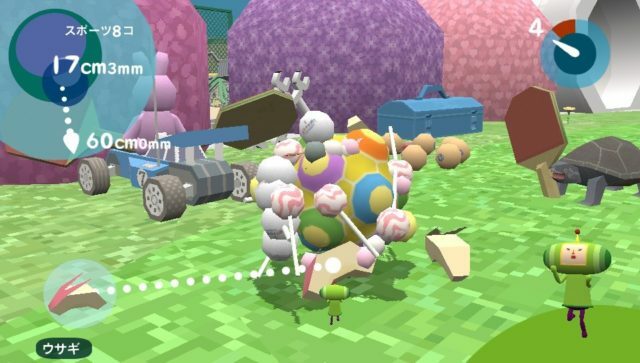 With myriads of items, skills and passive points available, players are encouraged to create vastly different but equally powerful builds capable of clearing all the contents of the game. Since PoE is set in a dark fantasy world, the art style is dark, gritty and realistic. The game levels are often castle ruins, cities on fire, dark caves, forests infested by mutated beasts etc., depicting a world plunged into chaos. The slow and mournful music also paints a bleak picture of the world. PoE is built using in-house game engine developed by Grinding Gear Games (GGG), which is capable of rendering 3D graphics and particle effects. Performance improvements are introduced along with game updates from time to time. Players spend most of the time in PoE slaying monsters and slaying lots of them, ranging from small hostile animals to end-game bosses. Being able to slay an entire monster pack after monster pack and blazing through game levels fast and efficiently let players experience wielding god-like powers. As players venture into higher-level areas, the number of monsters that can be slain increases, further reinforcing the sense of power. Fallen enemies drop loot, allowing players to amass currency and items, which in turn empowers them to fight even stronger foes. PoE presents a large number of options for players to create different builds, i.e. combinations of skills, passive points, and items. Players must plan their build carefully in order to overcome all the challenges that the game can throw at them, otherwise, they will end up with an underpowered character. Some builds are relatively easy to achieve while the others may require certain rare items to function properly. In each playthrough, players must consider how to acquire the rare items, either trading with other players or farming certain areas. As expansions are introduced to the game, the new content opens up new creative builds, waiting for players to discover. In PoE, powerful builds often require certain rare items or items with very good stats. These valuable items may result in the difference between a deathless boss fight and a long dreadful fight with many retries. Due to randomized item drops and a wide spectrum of stats, valuable items are difficult to obtain. The demand for these valuable items is reflected in their prices. Players are willing to pay large amounts of in-game currency to acquire said items to fit into their builds. However, some valuable items are better suited for certain builds than the others, so players can trade with one another to turn less useful items into items they need. Every 3-4 months, a challenge league is introduced to PoE, replacing the previous challenge league. Each challenge league provides some additional content to the core game and creates a fresh start for the players. As the name implies, challenge league also provides a list of challenges for players to complete. The challenges include simple tasks like crafting items, killing certain monsters, finding new items etc. as well as very difficult encounters such as slaying certain bosses without being hit or defeating the end-game bosses multiple times. Completion of the challenges awards players with magnificent decorations in their hideout to show off to other players. World of Tanks is a multiplayer third person shooting game developed by Wargaming, first realease in Russia on 12 August 2010. 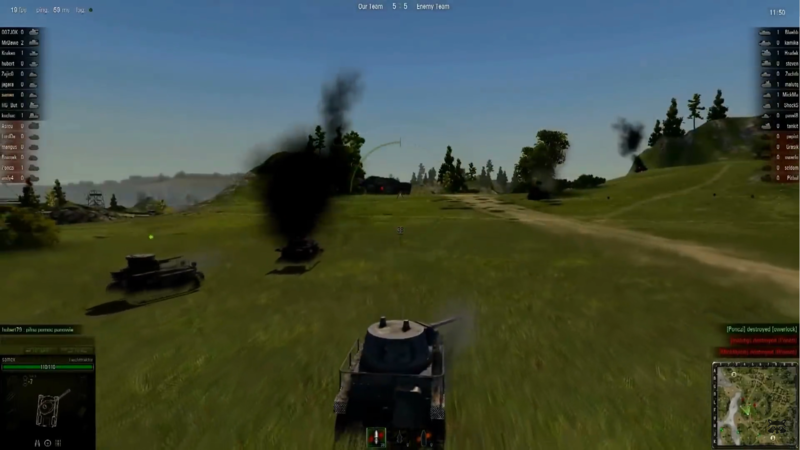 The game features combat vehicles from pre-WWII (around 1930) to post-WWII (around 1960), players will control these combat vehicles in a 15 vs 15 set up. There are currently 5 types of vehicles, which are the light tank, medium tank, heavy tank, tank destroyer and self-propelled gun, each type of vehicles has it’s own role to play. To win the game, either destroy all the opponent vehicles or complete the objective faster than the other team. Gameplay Trailer of the big upcoming graphic and mechanic update to the game. The tank models are very well made, the rust on the steel, the scratches on the paints and a bit of deformation on the armor plates to show the battle hardened vehicles. The battlefield comes in all kinds of environment, forest, city, desert and snowy terrain. The game’s graphic has serveral major updates throughout the years to stay on par with the raising standard of the game industry. Such updates include HD tank models, better lighting effect, rework of the sound effect and improvement of the tank movement physics. World of Tanks in upcoming 2018 updates. On the console platform of World of Tanks, there is a mode called War Stories which come with a story set up during the WWII era. Player has to complete the campaign mission in order for the story to progress. The game come with different types of vehicles mentioned previously, each type has its own specialized area. For example, light tanks have very high mobility, they often play the role of scouting, making the enemy visible to teammates. Heavy tanks have strong armor and a powerful gun, they are the main force that lead the team’s attack. Tank destroyer usually equip with the most powerful gun with highest penetration among its tier, but most tank destroyer do not have a turrest and the gun is fix at the front of the vehicle, which make it vulnerable to flanking. Penetrating the enemy armor involves some physics. Depending on the angle of incident of the shell, the effectiveness of the armor could vary. Besides that, different types of shell have different penetration capability, velocity and potential damage. 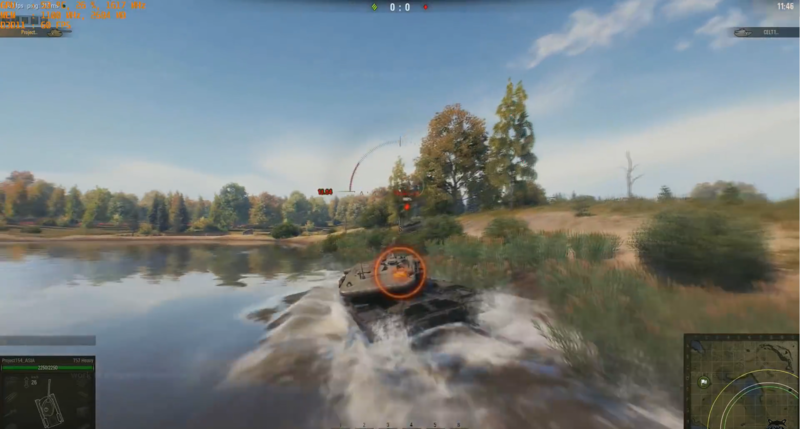 World of Tanks is currently changing its game engine from BigWorld to Core, where the new engine allow wind effect on grass and plants and wave effect on water when the tank gun fires. The lighting and shadow effect is also becoming more realistic, and destoryed objects such as walls and houses will now stay on the battlefield without disappearing, some parts of these objects may even stay on the tanks. 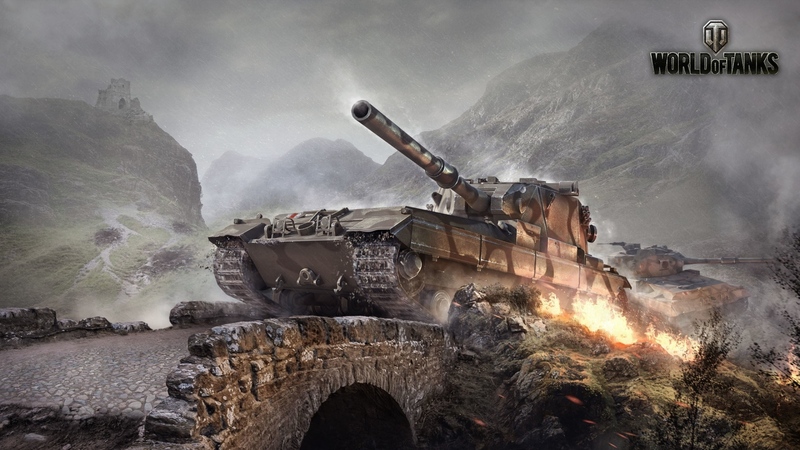 World of Tanks also involve the game of probability, shell damage and penetration value fluctuate around the average value. 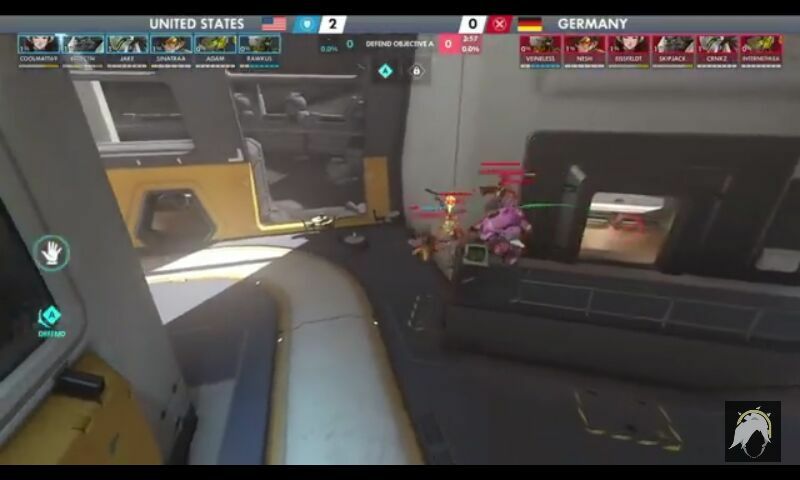 Thus, you have the chance to destory a enemy tank when its remaining hit point is actually higher than your shell damage. 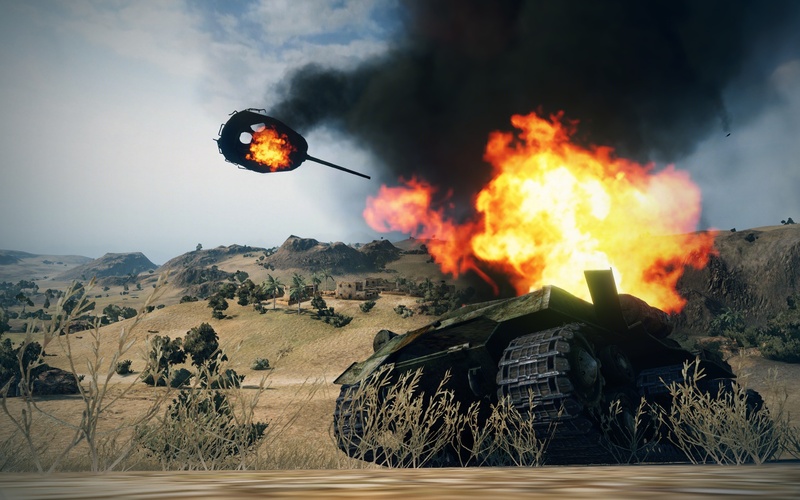 When penetrating the ammo compartment of a tank, there is a probability of ignite its ammo and kill it instantly. Just like performing a headshot in some other shooting games. A shell that ricochet from one tank may penetrate another tank nearby too. 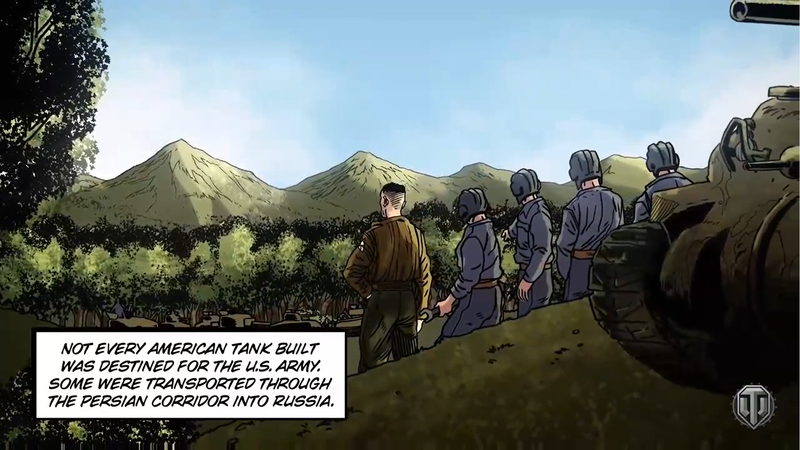 All players starts with tier 1 vehicles from different nations. Through battles with other players, we gain credits, research points and crew experience. Research points can be use to unlock upgrades and vehicles from next tier. Crew experience improve the tank crew’s overall performance and also allow them to learn useful skills. Credits are used to buy upgrades and vehicles. So the tier become higher and higher, the research points and credits needed for each upgrade and new vehicles become more and more. Thus the play time at each tier also become longer and longer. 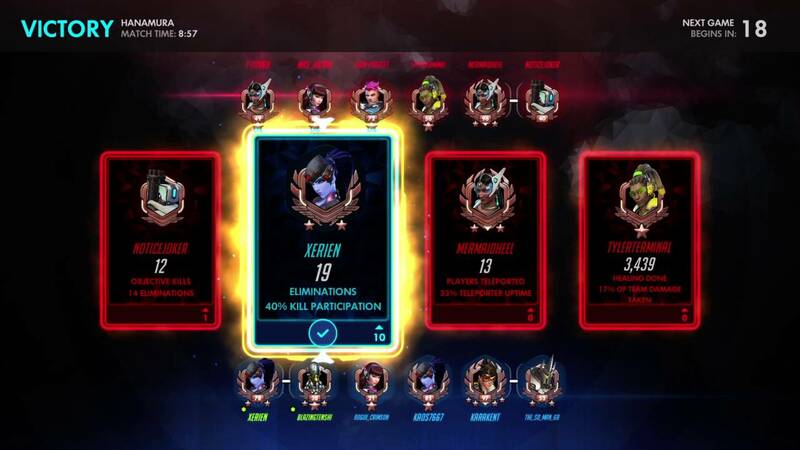 Besides winning the game, players may also earn different medals if they meet the requirement. For example, a Top Gun medal for player who kills the most enemy in a battle, a Pool’s medal for destroying 10 to 13 enemy in a battle, a Fadin’s medal for killing the last enemy with your last remaining ammo. Some of the medal are really hard to get as you need to be really skillful and also at the right occasion. 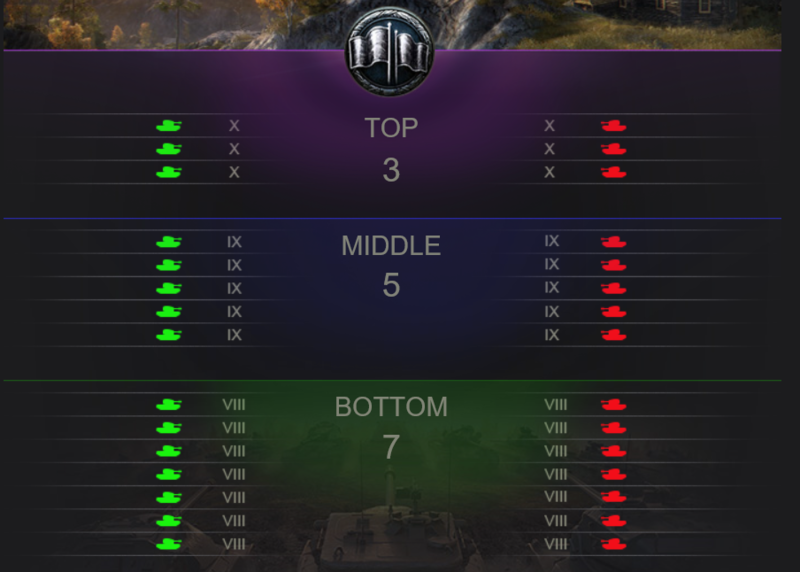 World of Tanks has a fair match up system. When battle is across three tiers of vehicles, there will 3 highest tier vehicles, 5 mid-tier and 7 low-tier on each team. High tier and low tier is at most 2 tiers apart. Most occasions, both team have equal types of vehicles. Sometime, the system would allow one side to have more of one type and the other have more of another type of vehicle for faster match up, but the difference is kept within +-1. The matchmaker also take into account of the players skill and win ratio, so to ensure each team’s average skill and win ratio are balanced. Sonic Mania is Sega’s first full foray into the Classic Sonic archetype since 1994, in celebration of Sonic’s 25th Anniversary in 2016. Developed by a group of what can only be described as ‘ascended fan developers’, the game aimed to recapture what made the Sonic series popular back in the 1990s, returning back to a 2D, 16-bit-esque visual design akin to the most recent classic Sonic title, Sonic 3 & Knuckles. In this game, you control either Sonic, Tails, or (not Ugandan) Knuckles, jumping, running and speeding through 12 differently designed zones, each character and each zone boasting their own personalities in order to stop Dr. Eggman from enslaving little critters and taking over the world. This game released to worldwide fanfare, and eventually, worldwide renown. It was praised for being a step in the right direction for the Sonic series, being the first Sonic game to score above 8/10 from many reviewers in 11 years, but what exactly made it incredible in the eyes of many? We’ll attempt to examine the game through the Lens of Game Design, to distill what the developers did right in this game. Disclaimer: Most of the lenses applied to Mania also applies to most of the other 2D Sonic titles, as Mania was meant to portray, emulate and exemplify what made the 2D titles popular and fun as compared to the recent 3D titles. As such, the elements described by the lenses may not be unique to the series as a whole, but they still show what the Sonic series does best. The game is simple – get to the end of the stage. You can jump, fly or climb through the stages to help you advance through the stages, but ultimately, how you get to the end is up to you. The obstacles in each stage will differ, and each stage will offer new skills to master, but none of that changes the goal. Run to the end of the stage to win. It’s a simple mechanic that always encourages the player to press on, due to its sheer simplicity; no matter what, you’ll manage to get to the end somehow. The story, as all games in the past, is kept simple and is only expressed and seen through non-verbal cutscenes. However, it is still easily understandable from the visual and audio cues. The story involves the villain finding an omnipotent jewel, meaning it’s the hero’s job to stop the villain from using said jewel to rule the world. It’s simple, it’s cliched, but it gets the job done and gives the player motivation to carry on through the game. Mania attempts to recapture the beauty of classic games by drawing everything in a pixelated form, as if to emulate the technical limitations of the Sega Genesis. However, it also improves on the pixelated graphics by refining everything, to make it look brighter, deeper, and more contrasted, painting everything in a more vivid colour to breathe new life into the series and the reused environments from old zones. This, combined with retro-styled music using chiptunes, immerses players in a game that oozes with blasts to the past. Though meant to emulate games of the past, Mania still takes advantage of the 8th generation consoles by allowing for more colours, higher fidelity sound, more audio channels, and most importantly, 60 FPS gameplay. All of this helps to make the game feel new and modern, despite its retro aesthetic. The aim of the lead developer, Christian Whitehead, was to bring Sonic back to its roots and show the world that Classic Sonic could still work in the modern times. In order to honour the roots of the series, as well as to pay homage to the longtime fans of the series, Whitehead and his team decided to evoke as much nostalgia as they could, through the use of fanservice. The trailer above was the first sight of a proper 16-bit Sonic title in 22 years, and was met with (literally) thunderous applause from the moment it was revealed. Despite the year-long delay of the game, people still anxiously awaited its release, and when it did release, fans of the series were rewarded from the getgo. 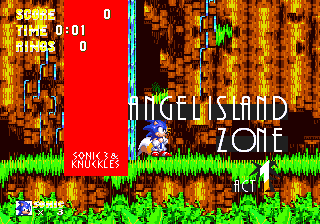 The moment the game is started, fans will constantly be bombarded with waves upon waves of nostalgia: the starting cutscene takes place in Angel Island Zone, appearing almost exactly as it did in 1994’s S3&K, followed immediately by the classic Green Hill Zone as the game’s first stage. 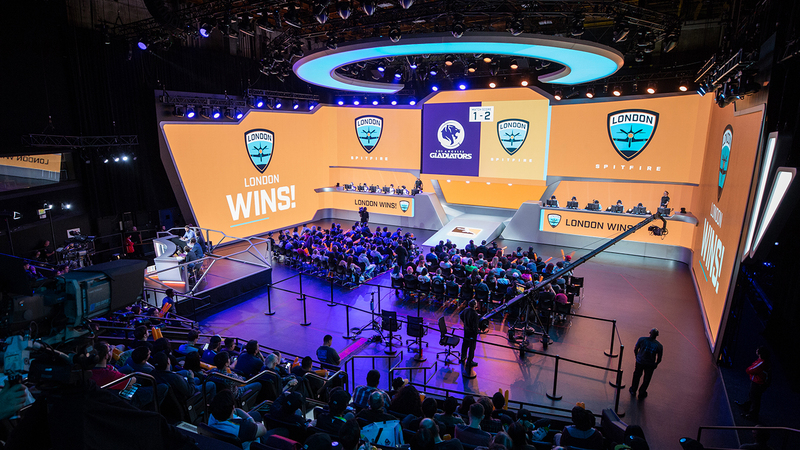 As players progress through the stage, they will continue to venture through old stages interspersed between new stages, in order to keep the whole experience both nostalgic and yet fresh. That is just the visual design – the gameplay itself runs almost exactly as it did 22 years ago. The developers attempted to replicate the physics of the Classic games, and managed to almost perfectly emulate the way the Classic games used to play. This only further immersed the players in the retro-ness of the game, allowing them to feel as if they were playing a game on their Sega Genesis way back when. They attempted to evoke one of the hardest emotions to evoke effectively from players, without milking it completely dry, and played it to their advantage. What exactly about the gameplay, though, made it fun, and made people want to come back for more? As explained earlier, the mechanics of the game are simple. When it boils down to it, you only have a few moves – for Sonic, you either run or jump, and sometimes Drop Dash. You only need these 3 moves to finish the entire game. However, how you finish it using these 3 moves is what matters; do you jump in at full speed? Do you slow down a little so you can control your jump and landing point? Do you jump lower of higher to get the least airtime, so you can conserve your horizontal momentum? These are just several questions that you intrinsically ask each time you push the jump button. It’s a simple action, with simple responses, but the possibilities are endless. Each jump you make could lead you to a secret area, if you know how and where to jump. Each jump could lead you to destroying a chain of enemies, if you know where and when to hold forward. Furthermore, each intricate action is rewarded with more speed, and greater heights to carry you through the stage even further; an example of this would be the video viewed in the first lecture of Sonic The Hedgehog 2, where the first stage can be cleared in just 15 seconds, if your movements had computer-like precision. As can be seen, the higher routes usually have a lot more empty space, while the lower routes results in much more jumping required to get to the end. Of course, this tradeoff doesn’t come without requirements. Higher routes usually require sufficient speed and precision jumping in order to jump on the enemies required to get to the platform. Furthermore, these enemies often don’t respawn, meaning you only get one chance to take the higher route. This is a test of skill that rewards players for making riskier plays with a quicker path and less obstacles, and is one of the staples of the Sonic series that Mania demonstrated well with its level design. The final lens we’ll use to examine the game is tied with the earlier point of nostalgia being the emotion Whitehead and his team aimed to evoke through Mania. Throughout the development cycle of the game, only 2 zones were announced publicly, with the other 12 zones being unknown to everyone until release day. This meant that on the day of release, fans were pleasantly surprised by every ounce of fanservice left in the game for them to savour, from minor incidences to major gameplay elements. In fact, one way that Mania used surprise to its advantage to milk nostalgia for all its worth is in one of the bosses. In the second Zone of the game, players don’t fight an ordinary boss. This is the boss of the Zone. 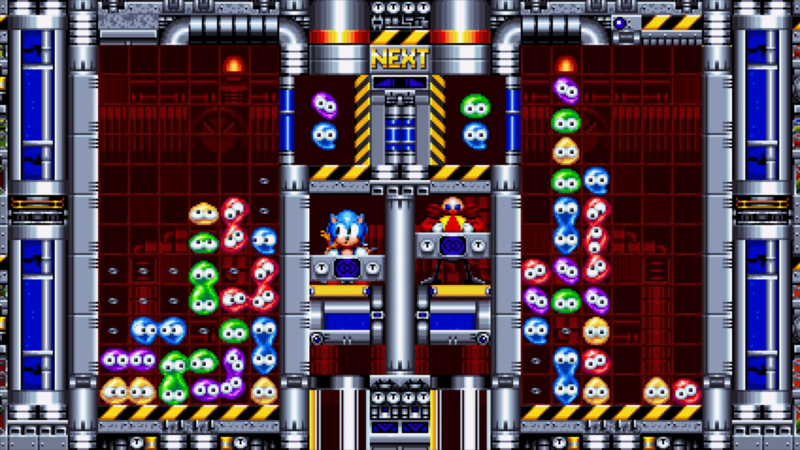 This boss hails back to a game that a number of American fans would have played – Puyo Puyo, or in this case, Dr Robotnik’s Mean Bean Machine. It was an unexpected gameplay change that struck a chord with every Genesis fan due to its elegance and, despite its odd place, how fitting it was in the game, as a throwback game. Of course, other small nuances also served as a completely different surprise to keep players guessing as to what was coming next. Each Zone has 2 Acts, and oftentimes, Act 2 of a Zone would introduce a new gameplay element that was never present in the series before. These elements spice up the game at each point, and serve to refine each Zone’s personality, ensuring that each Zone is distinct and unique from each other. Mania was a masterpiece that was the result of passionate game designers who believed in their franchise, and most importantly, the aim of their game. They utilised as much as they could from the old games, refined each element carefully, and polished everything into a neat little package as what was heralded as the ultimate homage to the Sega Genesis days of gaming. With this, Sonic Mania serves as a prime example of how to do a classic platformer right in today’s modern era. Beginning in 1997 with the release of the first installment, Fallout is a series of action role-playing games originally developed by Black Isle Studios for Microsoft Windows and Mac OS X. After the release of Fallout 2, the main series took a decade long break when Black Isle closed after getting bought out by Interplay Entertainment. Bethesda studios released Fallout 3 on October 28, 2008 for both PC and consoles. Fallout 3 was a highly acclaimed game, receiving many awards and gaining the series a lot of attention. In 2015, Bethesda release the latest installment in the franchise. Fallout 4 is an open-world game set in a post-apocalyptic United States. In the world of the narrative, your family enters an underground nuclear bomb shelter in 2077, and you alone emerge into the post-war wasteland in 2287. Your spouse is dead, and your main goal is to find your son who was stolen from the vault as a baby. From Pip-Boy menu to the radioactive craters, Fallout 4 has post-war aesthetic that it unfalteringly adheres to. The series creates a world that does not vary much between the games. The Fallout games unify even its most inconsequential assets right down to Washo detergent. Any long time player of the series would be able to list off the fictional branding within the Wasteland. 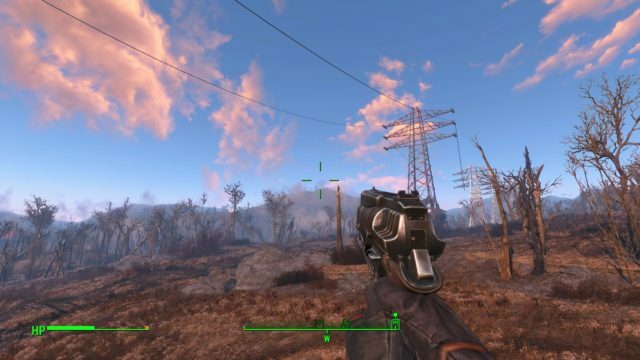 Fallout 4’s graphics paired with its open world gameplay was at the top of the industry at the time of its release. Starting with Fallout 3, the series uses realistic 3D models to depict the Wasteland, and interactions between the player and NPCs are mostly realtime. One of Bethesda’s main goals between each of the studio’s releases is a complete graphics overhaul. Fallout 4 was no exception, and the studio pushed out another environment full of props and enemies ready to be explored. Fallout 4 mechanics are pretty basic as far as current games go. The player has the option between first and third person, and the camera and player movement is controlled by the joysticks or a keypad and mouse, actions are handled using the trigger or mouse click, and so on. The really defining mechanic of the series is V.A.T.S., a targeting system which allows even inept players to take out enemy targets. Screenshot: View of an active V.A.T.S. mechanic. After some amount of recharge, a player can use V.A.T.S. to queue specific shots at specific body parts of nearby targets. This system is a call back to the turn-based combat of the first two installments of the series. Storywise, the Fallout games tend to follow some variation of the same the narrative: the player emerges from a vault shelter into the Wasteland for the first time and with no knowledge of the current state of the world, and he or she must seek out some other person. Fallout 4, like the others in the series, has its nuances, but after several games of a similar plot, the story comes second to just exploring the world and completing side quests. 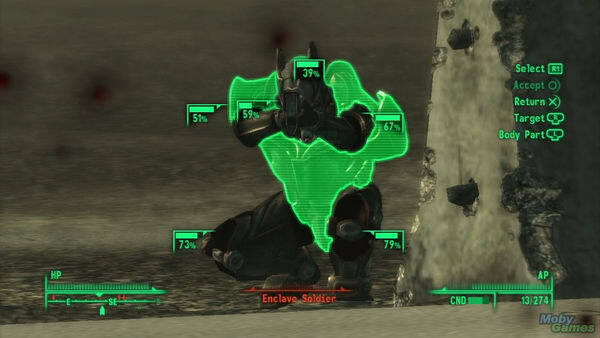 The two major areas that Fallout 4 could be enhanced in is in story and in mechanics. The names and faces change with each new title, but because of the strong aesthetics across the series, each new game feels more and more like a remake of the last, just with improvements to the technology. Along a similar thought, adding a new mechanic to the game has the potential to refresh the story. 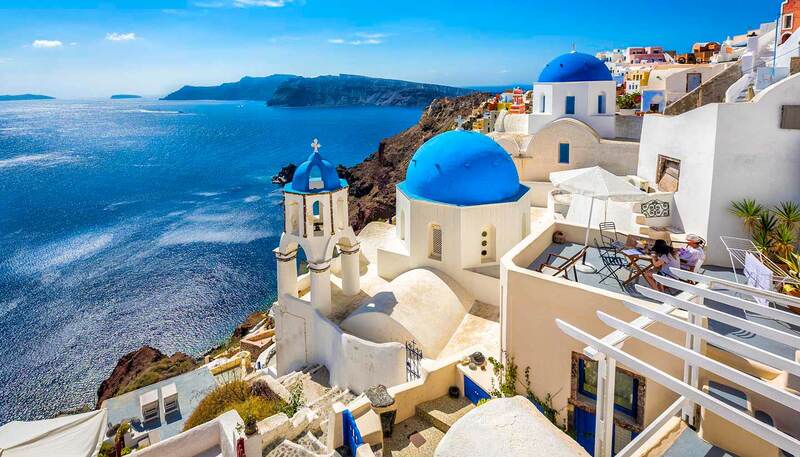 Fallout 4 attempted this through it’s settlement building system, where the player could create and operate their own settlements at various sites throughout the map. Unfortunately, the feature ended up having the feeling of post-apocalyptic Sims, and did not greatly affect the rest of the gameplay. Because the settlements mechanic lacked integration, the game felt unbalanced at times. A player could spend hours of the game creating a massive settlement with all the best artillery, and still not have made any progress in the actual storyline of the game. The time it takes to complete Fallout 4 is completely at the hands of the player. If the player finds pleasure in a particular type of quest within the game, he or she is more likely to continue playing and exploring the open-world map. Fallout 4 has the potential to frustrate players by its scale and the length of time it takes to complete quests. The player can go through only the main quest line, but they will experience greater difficulty as the game progresses because many of the perks are buried in the dozens of side quests. If a timing system were to be installed, the player’s freedom to explore the Wasteland would be lost. Fallout 4 is a modern take on a choose your own adventure story, and with that there is no easy way to cap the amount of time quests should take. At its root, the goal of the player is to find their son and change the society of the game to fit their ideology by aligning with one of the game’s four factions. 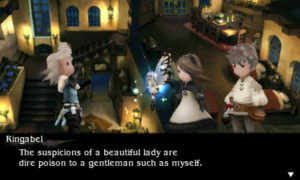 The goal is reiterated many times by the NPCs and dialogue options of the player. The goal is met as the player moves through the Wasteland and learns more about its inhabitants. Achieving these goals is secondary to the enjoyment of actually experiencing the game. The more creatively a player can change the course of a game, the more rewarding completing the goals are. There are plenty of short term goals a player can achieve by accepting side quests. Completing side quests ultimately makes achieving the main goal more fulfilling. The player is in control over how many of the narrative’s goals they complete, and whether or not they complete them for good or for evil. 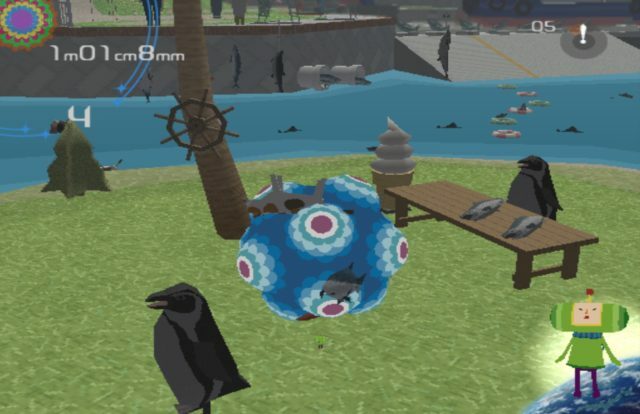 The player can examine almost any asset in the game. While not all of these assets are destructible, there is still a huge level of interaction between the player and the environment. This interaction is done entirely through a keyboard or console controller, so the player’s experience of the game relies entirely on the audio and visuals of the game. The best physical mapping of the game is through a console controller, which shakes and vibrates alongside the world of the game. If the player uses a gun, the trigger on the controller is an accurate mapping, but the player can use any number of weapons. If the player chooses to use a bat or fists as weapons, the physical interface becomes much less direct. Fallout is known for its weirdness. It is the most endearing quality of the game, and the reason fans remain so loyal. These nonsensical moments and hidden scenes are scattered throughout the map where only players who leave the main story to seek their own adventure may find them. Screenshot: Fallout 4 easter egg. The weird moments may confuse the player, but they never break the rules the game has laid. 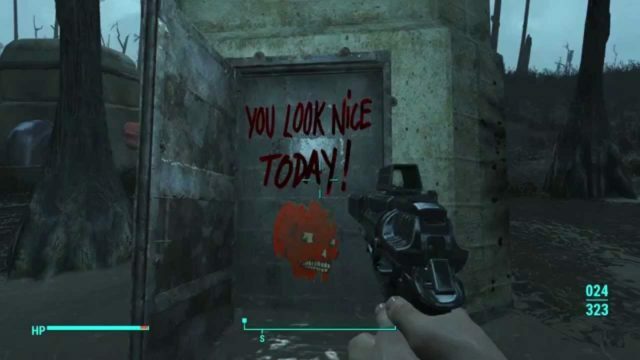 Easter eggs in Fallout are usually allusions to pop culture. Fallout 4 uses its weirder moments to break up the sameness of the Wasteland and it’s quests. 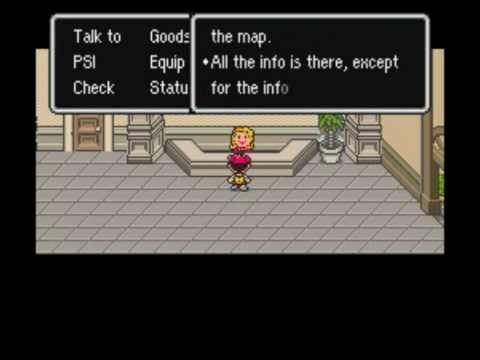 Earthbound is a single-player JRPG released in Japan on 27 August, 1994 and released in the United States on June 5, 1995. Also known as Mother 2, it was co-developed by Ape Inc. and HAL Laboratory and published for the SNES. Notably, one of the developers of the game was the late Mr Iwata. Although Earthbound did not perform well sales-wise overseas due to a somewhat satirical marketing campaign and a mismatch of market expectations, it managed to acquire a significant cult following due to its unorthodox writing and quirky gameplay. Eventually, word of the game spread out and Earthbound began receiving critical acclaim. 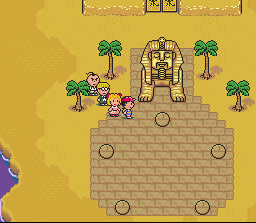 Earthbound tells the story of a party of four children – Ness, Paula, Jess and Poo – travelling on an adventure to try to defeat the evil alien Giygas (who has spiralled Earth into chaos). 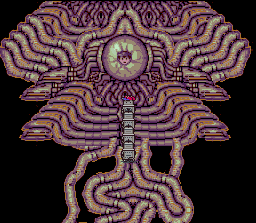 It must be said that Earthbound’s visuals, even for its time, is average at best (comparing to releases in the same era such as FF6, Chrono Trigger, etc). However, Earthbound does extremely well in being able to portray a great amount of character and flair even with the simple and childish pixel art style. A diverse bunch of characters. Like many JRPGs, Earthbound contains a wide array of soundtracks but it also breaks free from the norm with some “weird” ones befitting its surrealistic story. All in all, the music is another one of Earthbound’s great features which is masterfully melded with the story and art. Going into a ‘battle scene’ when entering combat. But, it provides a few twists to commonplace mechanics. 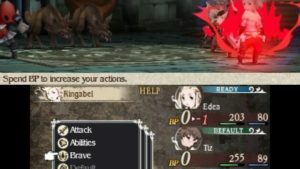 In battles, ‘health’ of a character is represented by a scrolling number wheel. Rather than instantly depleting health when taking damage, the number wheel scrolls down gradually – giving players a chance to rush to heal up his character before dying. Having fast fingers may help you turn around a fight! HP and PP are represented as scrolling numbers, like a slot machine. The crowning factor of Earthbound’s success. 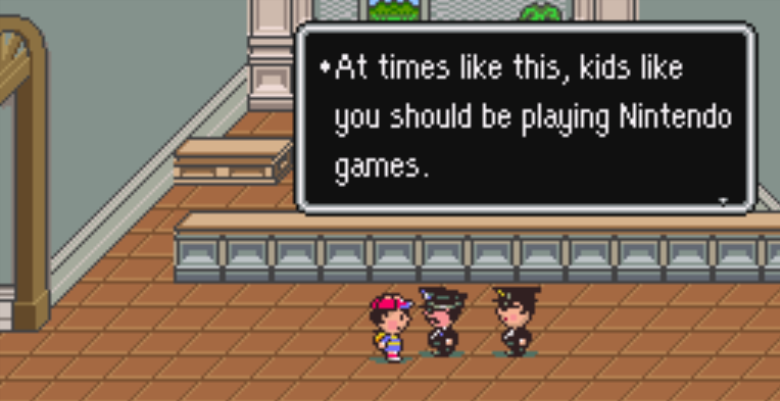 Many have praised the unconventional writing in Earthbound and having played it myself, I very much agree. 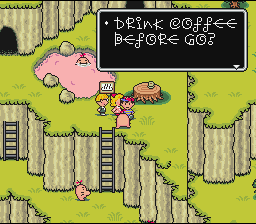 Earthbound’s narrative is both comedic and bizarre in nature. Yet, this is not a boon in the game’s design. 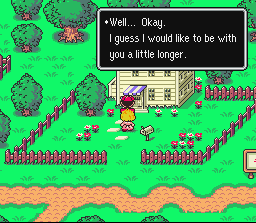 I’m already playing Earthbound, y’know. 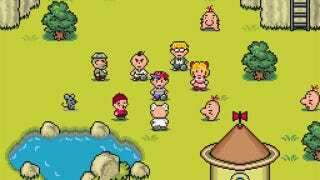 The story of Earthbound takes Ness and his friends across many scenarios which can be considered puzzles. Combat is still a thing, but acts as a means to an end – solving the puzzles. In simpler puzzles, NPCs may send the party on an errand and one must figure out where to go and what to do based on the instructions given. In more complex ones, you may have to find and piece together clues to solve a code or figure out which sequence of NPCs to talk to in order to get the required item. A puzzle requiring you to step the buttons in the right order. Do not be fooled by Earthbound’s child-like appearance. While it seems marketed for kids to play, under the layer of flowers and sunshine lie some adult themes such as depression, abuse, corruption, cults, xenophobia, innuendos, etc – a parodical, tongue-in-cheek representation of modern society (at that time, maybe even now). This juxtaposition from the common expectation provides a interesting twist to the game and fits well with the imminent doom from Giygas, as if letting us be aware of the evils of the world we have today. Perhaps, there is a hidden lesson to be learnt here. We know what they look like, let’s not talk about it. Besides having big twists in the story, one would also never expect a creature coming out of a Lovecraftian horror book to appear at the end of such the colourful and quirky game we played for the past 30 hours. The adventure takes our four heroes on a sprawling journey through many settings, littered with encounters with characters of all types, aliens and dinosaurs included, each with their own unique personalities. Many of these characters are inbuilt into the story in different manners, making each obstacle faced by our heroes special in their own way. In some cases, species have funny traits. For example, the tribe of Tendas who are extremely shy and the Mr Saturns who speak in extremely disjointed english (accompanied by a bonkers dialogue font!). In my opinion, these minor oddities really build up the characters of the NPCs and make the game as a whole feel that much more alive (and strange). Mr Saturns and their weird talk. Bonds have always been emphasized throughout the adventure in Earthbound – bonds between family (and dog), bonds between friends, forging new bonds with strangers. Rather than a mystical book or a shining light, the save spots in Earthbound are telephones where you talk to your father (who is unseen in the game, presumably a mimicry of the work-centric culture in Japan) for a bit before saving. Ness would also become ‘homesick’ (a negative status effect in battle) if he has not called home in a while. As a result, when I played through it, there was a small sense of melancholy as I empathised with Ness being away from his family for such a long time. Even after the world is saved and the game is over, new dialogue would be written for many of the NPC’s, particularly those whom you have bonded with along the journey. For me, it served as a bitter-sweet conclusion to the game as I had only a little time left before I had to part ways with the characters which grew on me as well as the adventure I took playing the game. Earthbound is a great game than lasted throughout the ages, inspiring many popular games such as Undertale, Lisa, Off, as well as tons of fan games. It is absurd, strange and crazy – and that’s awesome. 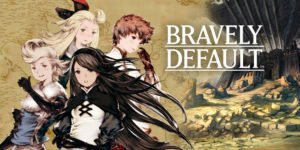 Bravely Default: Where the Fairy Flies, titled Bravely Default: Flying Fairy in Japan, is a Nintendo 3DS Role-Playing game originally exclusively released in Japan. It is considered by the publishers to be a spiritual successor to Final Fantasy: The 4 Heroes of Light, having the same initials as Final Fantasy with Flying Fairy and its job system has been compared to that of Final Fantasy V.
In this game, you control Tiz, a young boy who just lost his brother in an accident. He meets Agnes, who is on her way on purifying crystals to prevent the very same accident from happening again. Together, they embark on a journey, meet new friends, forms a party of 4 and saves the world…. Or what they were led to believe. The story follows the archetype of the current Square Enix games, revolving around the central theme of crystals. While it is not terribly unoriginal, its execution is what makes it stand out from the other 3DS games. It is delivered mainly through voiced dialogue which helps in bringing the character alive and the choice of music is apt in expressing the mood of the situation during the tide of battle (The soundtrack becomes a indicator of how long your special move lasts).. The cues are also well placed, from new encounters, intense battle to sad partings. The Road Back- Tiz completes his mission but it isn’t truly over yet. What starts off as a stereotypical story, slowly evolved into more than just any other fantasy story. The party of 4 began as one-dimensional characters but as the story progresses, their characters were fleshed out and developed beyond their initial archetype. Mini-dialogues that gives more insight to the everyday lives of the party and their relationships, making you feel more connected to them emotionally. Bravely Default slowly transforms its story from the standard good-vs-evil to a point where there is no clear line between good and evil. This lens meshes very well with the next lens that I will talk about. Achieve a milestone of the main goal and unlock new powers, all in one chapter. The story presents itself in arcs and the interest slowly builds up with the suspense creeping up, with the villain’s occasional appearances, leading up to the final boss fight. In between chapters, they take detours to rest or power up, providing a respite of tensions. After every chapter, it is a whole new chapter but with a growing backstory of the main ‘evil’ organization making its moves in response to the party’s movements. This rollercoaster ride helps in retaining the player’s attention by giving both periods of rest and peak, with a grand finale to top things off. Partly what contributed to Bravely Default’s success is its job system. Each character (in your party of four) has access to the same 24 jobs, each with a slight inclination to certain jobs but not limited to. At any point of time, only 2 jobs can be equipped at the same time, one as a main, the other as a secondary. A job itself is simple and focused on achieving a specific role, say White Mage is specialized for healing, Black Mage is specialized for offensive magic. As the player can freely mix-and-match the jobs, he is given the tools to come up with different strategies according to the natural synergies of the classes, rather than being force-fed them like a traditional RPG (where the heroes comes in a set class). The battle system is also straightforward, with the typical actions and elements you can find in an RPG. An interesting feature would be its Brave and Default systems. By Defaulting, you skip your turn while defending, gaining a Brave Point. By Braving, you spend Brave points to gain an extra turn. You can also go into a deficit, when you use your future turns in one go, allowing one to strategize. Do I bide my time or do I go all-out, risking vulnerability if I fail to defeat the enemy. This is where the emergent complexity kicks in. Different combinations of the jobs to explore allow one to experience many styles of gameplay. Within the jobs are a separate different combination of passive skills to equip as well. There are the general builds and there are niche ones like an ultra-defensive White Mage+Knight or an all-or-nothing Dark Knight+Monk. Jobs (and their respective skills) are earned on a gradual curve, thus the player is not overwhelmed with the whole 24 jobs in one go. The more I play, the more the game unlocks new possibilities for me, encouraging me to play even further. The Brave and Default system is easy to understand and the game introduces more layers of complexity when enemies begin to use and abuse the same system. They become smarter, being able to take advantage of your usual strategies, forcing you to rethink and try different fighting styles. 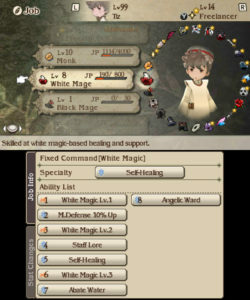 The version of Bravely Default I played was the updated version, where additional system controls were open to the player. 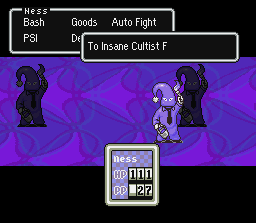 Normally in traditional RPGs (like Final Fantasy or Pokemon), when the player wants to avoid or induce battles, they can only do so through special items that influence the encounter rate. Bravely Default allows you to adjust that rate directly without the silly process of buying those items (begone Repels and Honeys!). This freedom to purely enjoy the story or when to grind for the upcoming boss fight (which is made unskippable), is what I feel most games should have innately without a paywall. Although the story is linear, and progression is one direction at the start, like its spiritual successor, Final Fantasy, the ability (or rather desire) to backtrack is unlocked past a certain point of the game, with fast travel. Last but not least, what captivated me was the plot twists of this game. Bravely Default comes with multiple surprises on various levels. Open Secret. The biggest plot twist was already shown right at the start without the player noticing it. With references to Donkey Kong (see above) and Super Mario Bros, we know that Braid was inspired by the legends of platformer games and also utilises the timeless mechanics of jumping on platforms and monsters. Like those games, you also have to “rescue” a princess from a castle. Combined with an intriguing new mechanic, the ability to control time, Braid became an legend of its own in the overly saturated platformer genre and was also recognised as a wonderfully made puzzle game. When it was released in 2008, many industry people said it brought the indie game industry to new heights by sparking people’s interest in indie games. But that’s not all about it. The true reason why this tiny indie game is immensely famous is because of its seemingly simple story with a huge twist at the end of the game which conflicts with all your preconceived notions of what the aim of the game is. Its developer, Jonathan Blow, who studied both English and Computer Science, combines art, literature and game design in unprecedented ways. Eventually, you can’t shake off the feeling that you are being played by the game instead. Speed run: Will have spoilers!! The platformer mechanics like walking, jumping on platforms, triggering a switch to move a platform, avoiding dangerous projectiles are timeless. The ability to jump on monsters to kill them is also a classic mechanic from Mario Bros that many people are likely to be familiar with. Braid then adds a mechanic which is the ability to reverse time and fast forward time. Not all objects are affected by time, thus the player has to make use of this time mechanic to collect the jigsaw puzzle pieces. In world 3, walking left will reverse time, walking right will fast forward time. In world 4, every time you reverse time, it will create a doppelgänger shadow that does what you did in the past. With mechanics that are kept simple, Braid manages to come up with many genius yet varied puzzles for players to solve. Another impressive part of the mechanics is that they have “dynamical meaning”, a term coined by developer of Braid. This means that the mechanics will communicate emotionally to you, like how tutorials are incorporated seamlessly into the first few levels of every world. You are not told explicitly what to do. Additionally, the mechanics of the last level helps to tell the story, which we will talk about later. 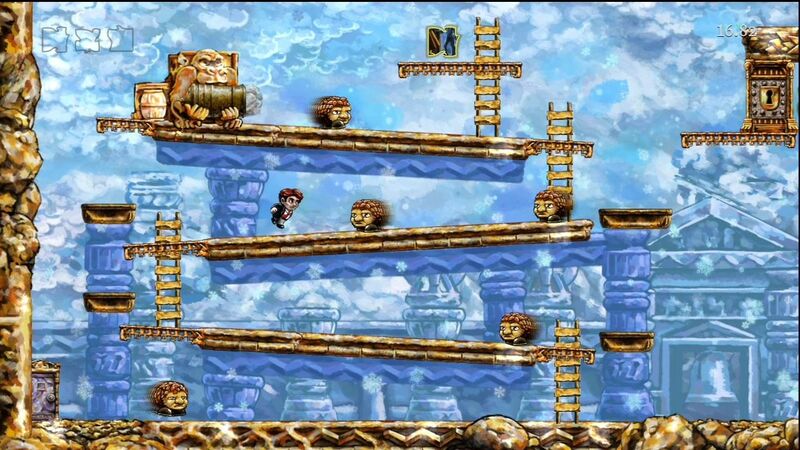 Braid uses a timeless 2D art style that does not distract you from the puzzles and yet is still pleasing to the eyes. The rugged 2D graphics gives it a more indie feel, plus the tinge of nostalgia that the art brings also helps to set the atmosphere for the story, a story of nostalgia and regret. There is no breakthrough technology used with a 2D side-scrolling platformer but this is great because it does not complicate the mechanics. Braid was first released on Xbox and then ported over to PC. The time forwarding and reversing is natural on a Xbox controller because it uses the L1 and R1 buttons. It implements some basic “game” physics for its puzzles. Jumping off a slope will give you a slight increase in speed and jumping on monsters 2-3 times will increase your jump height and this technology is part of the puzzles. On the surface, the story seems to be just about a guy regretting his mistakes and thus the princess left him and he needs to save the princess from a castle. He is also trying to relive his memories with the princess along the way. However, the vague narrative text seems to hint something more than that. The text uses many metaphors and often provides more insight into humanity. It even makes reference to the Manhattan project that created the atomic bomb. The player has to analyse the texts to make sense of the story, opening the story to different interpretations. The story was meant to be distinctly separate from the game puzzles as the developer felt that he did not want to force any player to read the long narrative text. He felt it might also distract them from the actual puzzle solving. However, I personally prefer a story that is strongly tied to the puzzles, rather than solving all the puzzles in the world, only to be met with a dinosaur at the end that says that the princess is not in this particular castle. There is no surprise that Braid is full of surprises as a puzzle game. Firstly, surprise is first delivered through discovering the solution to puzzles.The solution could be surprisingly simple. Secondly, there are tons of hidden things to discover in the game. There are hidden jigsaw puzzles pieces to be collected and pieced together to form pictures and they unlock the last level. There are hidden levels where you can collect stars instead. These will form a constellation once they are all collected and unlock the epilogue and the true ending. The epilogue, in my opinion, is the biggest surprise, giving unexpected insights into our main character and explains the metaphors in the story. Braid has mechanics which is easy to learn but difficult to master, this helps it to come up with both very easy puzzles (which are often tutorials at the start of each world to introduce a new slant to the time mechanic) and also very difficult puzzles near the end of each world. These difficult puzzles can be skipped as those jigsaw puzzle pieces need not be collected unless player is aiming for 100% completion. This allows beginners to progress through the game and improve their skills along the way first. They are allowed to come back to solve these difficult puzzles later. Thus Braid successfully caters to players of varying abilities. Alternating between easy and difficult puzzles is related to the lens of flow which we will mention later. The game manages to fluctuate between relaxation and tension by ultilising parallelism (see lens of parallelism) and levels of varying difficulties (see lens of challenge). Thus this creates a flow for players to increasingly feel enjoyment. Thus, this is a game that is impossible not to learn from as a game designer even 10 years later in 2018. Though painfully crafted puzzle games might not appeal to a wide audience, Braid combines an amazing narrative with a unique time mechanic twist to our classic platformer genre. 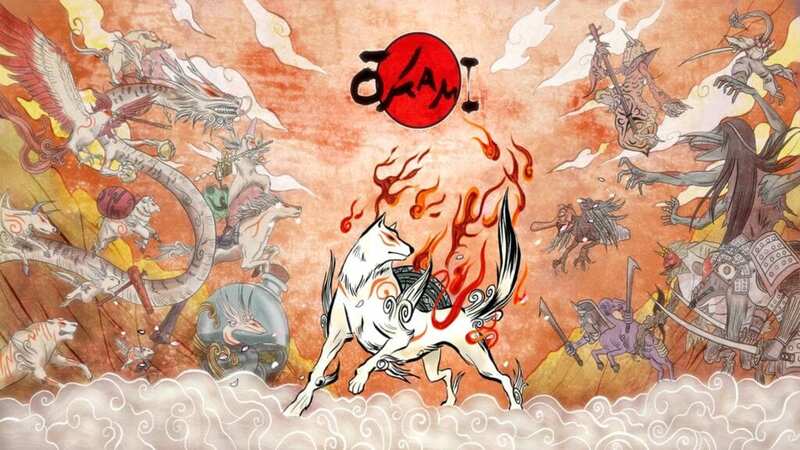 Okami is an action adventure game developed by Clover Studio and published by Capcom. It was initially released on April 20, 2006 for the Playstation 2, but has since received multiple ports featuring updated controls and graphics for the Wii, Playstation 3, PC, Playstation 4 and Xbox One. It was highly acclaimed, receiving over 30 different awards including Game of The Year, Best Overall Story, Most Innovative Design and Best PS2 Adventure Game. The game is set in the context of classical Japanese history and uses elements found in Japanese folklore to tell the story of how the land was saved from darkness by the Shinto sun goddess Amaterasu, who takes the form of a white wolf. This doubles as a pun on the title of the game, as both 大神, or great god, and 狼, or wolf, are read as Okami. Okami’s world is set in a beautiful, cel-shaded environment with a water colour style that was designed to resemble traditional Japanese ink wash paintings. As Amaterasu runs, flowers spring forth in her wake, brushstrokes that symbolise the wind flow past occasionally, and the very aesthetic of the painting ties in to Okami’s most unique mechanic. Okami contains a mix of action, platforming and puzzle gameplay. Like many others of the genre, Amaterasu can run, jump and fight in real time. She has health points that when depleted, results in a game over, an inventory to store items and currency, and stats that she can level up. In addition, Okami’s most unique mechanic and Amaterasu’s signature ability is to be able to use her tail, the Celestial Brush, to draw patterns on the canvas that is the screen. This lets her use 13 different techniques to solve puzzles, manipulate the environment and defeat enemies. The patterns players need to draw are easy to execute, consisting primarily of swirls, lines and circles. Amaterasu only starts with one of these techniques, and players are allowed to slowly get used to her different abilities as she learns them throughout the game. By using the proper technique, players are able to cause the Sun to rise, restore broken objects, slow down time or call upon the elements to smite their enemy, amongst others. Given the power and versatility of the ability, Amaterasu is limited by a slowly regenerating resource of ink to discourage players from carelessly using the brush, as running out of ink cripples Amaterasu all around. 100 years prior to the game’s present day, a great white wolf, Shiranui, and a swordsman, Nagi, sealed away the eight headed serpent demon Orochi. In the present day, Susano, Nagi’s descendant, unwittingly sets Orochi free. Orochi curses the lands, and drains the life from Nippon. Amaterasu, the goddess of the Sun and the reincarnation of Shiranui, is called forth to remove the curse and to restore the land to its normal state. Amaterasu, along with her companion Issun, set out to regain the powers of her Celestial Brush and gather Praise from the people of the land, eventually going back in time to stop Orochi at his peak and defeating the symbol of Darkness, Yami. Throughout the story, Okami takes elements from Japanese mythology, such as having Kaguya, from the Tale of the Bamboo Cutter, and the Celestial Brush Gods representing the 12 animals of the Asian Zodiac. The cel-shaded artstyle and simple aesthetics is relatively less graphically intensive as compared to many other games of its time, and helps it age very well even into the present day. One of the challenges I found that Okami faces is its controls and how to make drawing using the Celestial Brush effective for the player. When I played on its original release on the PS2, I found having to use the analog sticks a little awkward at times. Even though the patterns have been made simple to make it easier for the player, I found the ports on the Wii, which uses motion controls on the Wii remote to serve as the brush, and on the PC, which uses the mouse, to be much more natural and more comfortable for drawing. At the start of the game, Amaterasu is little more than an intelligent wolf. With nothing but her basic attacks and her only Celestial Brush technique being Sunrise, many of the villagers throughout the land are sceptical of her status as a goddess. However, throughout the game, as Amaterasu helps out the people of the land and regains her powers, not only is she a more adept combatant, she is also seen by the people in a new light, and becomes a goddess that people can truly put their faith in. At the end of the game, as Yami strikes down Amaterasu, isolates her from her companions and siphons all her power, it is the prayers and the belief of all the people that Amaterasu has changed the life of along the way that allowed her to rise once again and vanquish Yami for good. The player can, at any point outside of menus and cutscenes, bring up the canvas to use the celestial brush. Instead of having them relegated to specific zones, players are free to experiment with the various Celestial Brush techniques at any point and see how they interact with the environment and with the enemies. Certain techniques, such as Bloom or Galestorm, can have different effects on different targets. Being partially a puzzle game, Okami has its fair share of problem solving to be done. This mostly takes the form of sidequests where Amaterasu helps the people of Nippon and helping Amaterasu traverse the environment. While not extremely challenging, especially with Issun giving Amaterasu and the player advice on how to solve them, I found the slower pace of puzzle segments to be a refreshing change from the combat segments. Both the main quests and sidequests in Okami involve performing miracles and helping the people throughout the land. While this does have inherent gameplay benefits, as Praise is needed to increase Amaterasu’s stats, I found being able to make a change to these character’s lives, and convince them that Amaterasu isn’t merely a friendly wolf but a benevolent goddess watching over them to be very satisfactory. The final moments of the game, where the prayers from the people of the land that you’ve helped throughout your journey saves Amaterasu from certain doom at the hand of Yami, is also one of my personal highlights of the game.